Flour Tortillas - Uncooked 8 in. Flour Tortillas - NET WT. 4.58 LB (73.3 OZ) 2079 g.
We are sorry but we cannot ship Tortillas to: APO, FPO, etc, as well as Puerto Rico and Canada. Ingredients: Wheat Flour, Water, Canola Oil, Salt, Sugar. Nutrition Facts: Serving Size 1 Tortilla (50g) Calories 150. 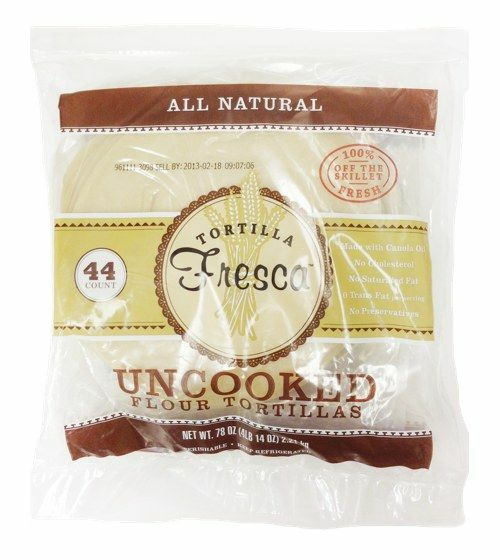 Uncooked Flour Tortillas by Tortillaland have been discontinued, instead they have been replaced for a similar product of the same quality by the brand Tortilla Fresca. Bring home the flavor, taste and aroma of an authentic homemade style tortilla. Ready in seconds, our flour tortilla will puff up right before your eyes, creating a warm and flavorful tortilla that tastes like homemade, without the hassle. All natural with no preservatives, 0 g cholesterol, no lard and 0 g trans fat per serving. 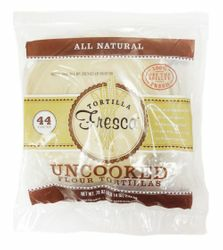 Tortilla Fresca flour tortillas are a delicious fresh choice you and your family can feel great about eating. Enjoy tortillas as a snack, quick appetizer or complement to any meal, use your imagination to make your own combinations. Buen Provecho! 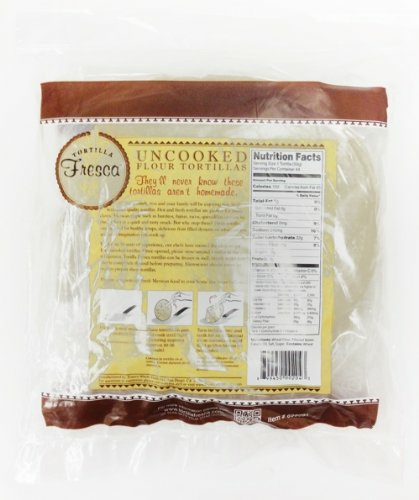 Tortilla Fresca allows you to bake this homemade flour tortilla for the first time, "Ready to bake in Seconds!". Uncooked flour tortillas are the result of a new and unique concept in home cooking. Enjoy the flavor, texture and freshness that can only be achieved through a homemade product. The bag contains an Oxygen Absorber Pouch to protect freshness. Once the bag is opened, discard the pouch and use uncooked tortillas within 20 days. Keep them refrigerated. Do not mix the uncooked and the cooked tortillas. May be frozen. Before use, thaw completely under refrigeration. Microwave may be used for reheating cooked tortillas only. Ingredients: Enriched wheat flour (bleached wheat flour, niacin, iron, thiamine mononitrate, riboflavin, folic acid), filtered water, canola oil, and salt. Contains: Wheat. Tortillas are made fresh daily and will remain fresh when they are delivered to your door. Just refrigerate as soon as you receive them and heat on stove top pan or comal. These tortillas are made with canola oil, no lard, no cholesterol, low in saturated fat and with no trans fat. Total package comes with 44 uncooked flour tortillas in a resealable bag (similar to a "Ziplock" bag) that protects freshness and flavor. Ready to bake flour tortillas. Serving size is one tortilla, with 140 calories each, from fat are 40 calories. Total fat is 4g or 7% of daily value. Sodium is 210mg or 9% of daily value, no trans fat, and no cholesterol. Enjoy! Las Tortillas de Harina Pre-Cocidas estan listas para comer, unicamente se calientan en la parrilla y ya estan. 44 Tortillas de Harina listas para calentar, en bolsas selladas que las conservan mejor y se pueden volver a cerrar. Para mejores resultados es bueno consumir el producto en un plazo no mayor de 7 d?as despu?s de abrir la bolsa interior y de preferencia no congelar, sino mantenerlas en refrigeracion para conservar mejor la frescura de las tortillas. Precalentar el comal, sart?n o parrilla a fuego lento sin aceite o mantequilla (400 F). Colocar la tortilla cruda en el sart?n y cocinar por aproximadamente 30 segundos de un lado, hasta que este ligeramente dorada y la tortilla empiece a inflarse. Voltear la tortilla y cocinar por otros 30 segundos hasta que se infle mas. Ojo, se debe tener cuidado de no tomar las tortillas con la mano por estar muy calientes, es preferible voltearlas y ponerlas en el tortillero usando una pala de madera. Finally a tortilla that tastes good! Tastes fresh too! I sent these to my mother in Oregon by mistake, sort of. Only when I saw the shipping information did I realize I'd bought flour, instead of corn, tortillas, as I'd meant to do. This upset me until I talked to Mom: she loved them, and they were absolutely flying out of her kitchen. You can find tortillas in Oregon, but not like this. My brother noted that they're non-GMO, which is something he tells me is on the package, but I couldn't read in the pictures. I'm sure I eat a lot of GMO crap, but this is a selling point that may not be emphasized enough in the listing. ProsFresh, prompt delivery of good food. These tortillas are worth the expense and time it takes for them to ship. Arrived in great shape - refrigerate or freeze immediately. I have re-ordered on these a couple of times since my first order and will continue to do so. I love getting the rolled out raw tortillas and then cooking them for consuming with my meals. These have been great for quesadillas as well as for eating with other food items like I grew up doing. No disappointments with these....I love over on the east coast and all the local sources seem to think too much flour, not enough baking soda, and rolled too thick are tasty....about like eating glue....so, these tortillas make my day. Just what a Texas girl needs when living in Maine! These tortillas are packaged well to ship and are delicious! Already recommended to friends. I just moved and cannot find these where I used to buy them. I'm so happy to have found them here. I love the taste of these tortillas. They don't smell like preservatives like the ones in the regular stores. Good for me!! Eat, eat, eat them with cheese, eat them with vegetables, use them with maple syrup, eggs, etc. My friends love them as well. Use them instead of bread. As delicious as I remember, and fast shipping! I first tasted these while living in Tucson, and I've been hooked ever since! Since leaving, I have been looking everywhere for a way to get these delicious beauties shipped to Maine. I found them here at MexGrocer and ordered two packages. The tortillas arrived within two days of shipping. They came in a Priority Mail box in a special insulated pouch with a cold pack inside. (Just in case anyone else reading these reviews wonders how they do it!) The tortillas were still well-chilled when I packed them away in my freezer and refrigerator. I heartily recommend these for anyone who has ever had a freshly made tortilla, or for anyone who loves homemade ones but doesn't have the time or energy to stand around making a batch. The simple ingredients = unbelievably delicious. Well worth the expense. I am a tortilla lover. I make my own when I have the time. When I dont, these are my first choice. I have tried a bunch of different uncooked tortillas. Most grocery stores in Houston have them. Even walmart has them in many cities. But they are ridiculously expensive too. A pack of tortillas should be a lot less. I was getting so sick of the garbage they sale in the stores here in Maryland. I miss the fresh one I used to get in Tucson. ProsThese are the best, cook as you need them. Freeze nice. great taste. These are easily the best tortillas I have ever had. I never cared for the store bought/restaurant tortillas that's so common on the east coast. When I took a trip to Texas I learned why. I found this site soon after and I'm hooked. Thank you! I was introduced to these wonderful tortillas on a camping trip over New Years. I immediately fell in love. These tortillas are so fresh and taste so good in just a few minutes I don't know how I survived for so long on the east coast without them. I am from Arizona. I now live in Georgia. I can't tell you how disappointing the tortillas are here. Aside from what is in the local grocery stores, there is nothing comparable. In Arizona, local tortilla manufacturers would bring in fresh, hot tortillas cooked that morning and placed on a display for purchase. After finding these tortillas as MexGrocer.com I don't buy anything else. If you have never tried a freshly made tortilla before, you have to try these at least one time. You will never go back to the thick, flour tasting ones again. Totally awesome!!!!! ProsFresh, easy and so wonderful! I am from Mexico, and I bring uncooked tortillas from there. Now I don't have to wait until I go back to Mexico, to have the tortillas. This are sooooo good, fresh, great flavor, home made.... You can't compare this one with any one you buy in the store!!!!! ConsThey are 8" I would love to have 6"!!!! Great product. We wish we could buy these in our area, but at least we can get them from MexGrocer. Thank you! When I originally ordered these, I thought that I would get this exact brand (Tortilla Land). I was able to get ground shipping and to my surprise, they came cold which is great. However, when I excitedly opened the boxes I saw that these were a completely different brand (Tortilla Fresca). I was really worried but I compared the ingredients and they are the same as Tortilla Land. I tried to look at the website for Tortilla Fresca but it brings me to a page that is showing "under construction." Anyway, I tried one of them and they are amazing. These are so so much better than the thick dry ones you get at a grocery store. I have all of my family hooked and we will be ordering these in bulk from now on. Delicious!! My family loves them plain or with yummy fillings . Easy and quick. It is impossible to find a descent tortilla in the stores once you get east of the Rio Grande, this product solves my problem! My kids, like me, won't eat any other flour tortilla! ProsFresh cooked tortillas are the best....these help me make those with out actually having to make them! ConsSometimes the uncooked tortillas get stuck together; which can lead to tearing, which can be frustrating! I live on the east coast and was introduced to these while visiting California. Now they are a must have, but I cannot find them in stores locally. There is no comparison to freshly cooked tortillas to the precooked tortillas they sell in the stores. These tortillas were so delicious. After my husband and I received them yesterday we just stood by the stove taking turns cooking and eating them. I think I ate at least 6 of them plain, standing by the stove waiting for him to finish cooking his so that I could have another one. They were so much better than store bought flour tortillas; I am definitely going to be ordering again. Thanks! Everything from the taste to the melt in your mouth texture.. these tortillas are to die for. Being of Mexican descent..I was fortunate to have my mother make tortillas from scratch. Tortillaland are just like homemade or better. MexCrocer is my choice for fresh & quality foods! We used to be able to get these where we lived in Colorado, but in the Midwest, not so fortunate until we found these available online here. We love them, and when we make them for company they rave about how good they are (can't take the credit though). They ship fast and fresh. Freeze fabulous. Highly recommend them! Have referred friends that will now also be customers of Mexgrocer. Thanks for making shipping available! ConsThat I can't get them locally. We lived in CA for a number of years and got very used to freshly-made tortillas, I was thrilled to find these in our grocery store. Sadly, they discontinued carrying them and I had to find them online. It took some doing to find them, but they are well worth it. It's they closest thing to the handmade ones in the restaurants in CA. I have recommended them to everyone and ordered several packages to give to people. They are so simple to prepare and I will NEVER buy another kind of tortilla again. ConsI wish I could order them is smaller packages than the 44 so you didn't have to open so many at a time. After several years in search of a good flour tortilla I finally found it! I'm from the Northern part of Mexico and the flour tortillas are a tradition. Now living in the in the East Coast, I was unable to find fresh flour tortillas until I found MexGrocer and this tortillas. They are excellent! Very convenient, fast and easy to make! These are great and give the taste of homemade tortillas with half the work. They shipped well even to my APO address, but be sure to refrigerate or freeze as soon as you get them. They are also tasty used raw for flautas or chimichangas, then deep fried, muy rico! these were delicious! I cooked them in a cast iron skillet on the charcoal grill. Flavor was wonderful. 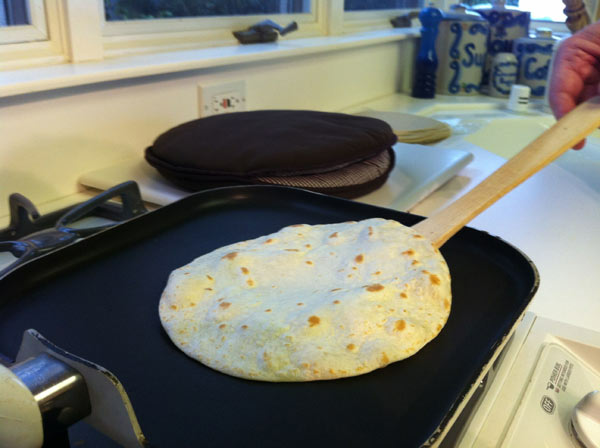 I usually make my own tortillas but sometimes i just get lazy and these come in very handy. For those of make your own from scratch, I have a hint, I and roughly chopped cilantro to the flour/fat mixture befor adding the water---delish !! These are AMAZING and have ruined me for all store-bought tortillas. They just take a few minutes to cook on the stovetop, and they have outstanding flavor, texture, and complexity. They make regular tortillas seem like cardboard by comparison. Try them! If you have lived in the border region, then you know that just about anything in a fresh tortilla makes the world a better place. I was born and raised in San Diego and now live in Utah. I miss fresh Mexican food! Must be in my veins. You won't find a better tortilla. We had friends here during Christmas week. I made shredded beef (roast) and cooked up some of these tortillas. Kids and adults alike devoured them. Price is a bit high, but you get over 40 and they freeze very well. I think they're worth it. I love it! Will definitely order more! These are the best! I used to buy them when I lived in Arizona but when I moved away in 2003, I couldn't find them anymore, not even online. This summer, I was in Nevada and found them in a supermarket and was overjoyed!! When I got back home to Michigan, I searched online and found them here at MexGrocer.com! Overjoyed, again, cuz now I can get them anytime!!! Muy bien!!!!! These are sooooooooooooooo good.....almost as good as my grandma's & she made THE best! Transplanted from Houston this is the ONLY available outlet for me to get uncooked tortillas and these cook perfectly! Very pleased! We used to get homemade "warm hot off the oven" flour tortillas from a neighbor when we visited in Mexico and afters she died we could not find anything to replace them until we found these. They are more healthy due to the canola vs lard and although thin, and delicious, they are very strong and do not fall apart - everyone who comes for Mecxican food at our house raves about them. Simply deeelicious!! Been buying these for over a year. Even have my sister-in-law buying them.